I had occasion, recently, to revisit a valuable life-lesson, but in order to enlighten you about that, I first need to tell you about our windows, my post-prandial cigar ritual and camping with my boys. Bear with me. The windows in our flat are “single glazed.” I’m not sure of the American translation of this because I haven’t seen a single-glazed window in the US since I was 16, but single-glazed means a window with a single sheet of glass in it. If you were lucky enough to have this type of window, you got to see beautiful frost patterns—on the inside of the glass—on many a winter morning. In the warmer months they simply steamed up and were, therefore, facilitators of mildew. They were the basic window; the kind everyone had since windows had been invented. In Britain, double-paned, or doubled-glazed windows are the norm, as well, but if you live in a block of flats that was built during the Kennedy administration (or the Macmillan Prime Ministership, or whatever the Brits call it) and you have a landlord who is too cheap to upgrade, then you have single-glazed windows. Given that it doesn’t get cold enough over here to form frost patterns on the windows, there is no advantage in having them and we have been looking forward to getting double-glazed windows since we moved in. And now we are. 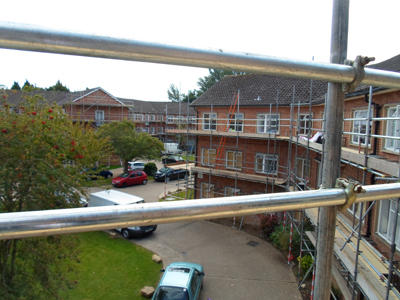 Step one of this process was to clad our buildings in scaffolding. 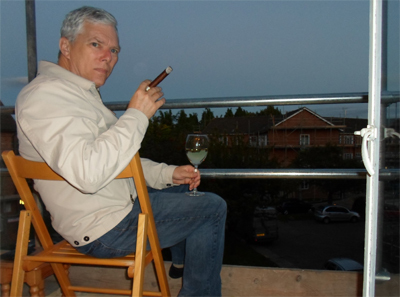 Although there is a sign hanging on the scaffold discouraging children from playing on it, I reasoned that I am not a child, nor did I wish to play on it; I simply intended to enjoy a beverage, my cigar and an enhanced view. So I did. Shhh! Don't tell anyone; I'm not sure I'm supposed to be up there. And life went on pretty much as it had before except with less parking and a lot more noise. Then one day, it rained. Very hard. The umbrella rattled like a snare drum while beneath it, in my circular sanctuary, I remained snug and dry as summer sand, and this brought to mind memories of pleasant days spent camping with my sons. 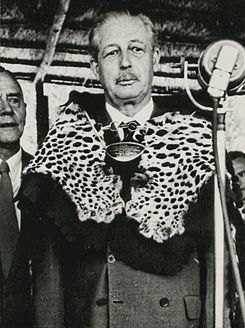 We would make camp, then stretch our tarpaulins tight over the site, carefully angling them so any rain would run to the edges and not collect in the center. And then we would dig trenches to divert the water away from the camp. (I wasn’t a Boy Scout for nothing, you know.) On many trips, the tarps served merely as sun shades, but other times it would rain, and then—because of our preparations—we could sit at the picnic table, enjoy a cup of coffee (or a can of Coke for the boys) and watch the deluge, comfortable and confident and, more to the point, dry. I embraced this memory, and luxuriated in my little oasis of calm, my microcosm of campsites past. It was a moment of unexpected serenity and surprising contentment. Then my neighbor opened a window to say something to me. Now, under the umbrella, it sounded like I was sitting inside a waterfall. It told him I couldn’t hear him, so he shouted louder, and still all I could hear was the roar of the water. Eventually, so as not to appear bad-mannered as well as insane, I unfurled the umbrella and sat in the rain in order to hear what he had to say, which was that he could not believe I was sitting out there in the rain, something I sort of already knew. 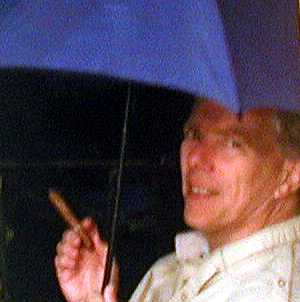 Satisfied, he withdrew and I put the umbrella back over me, but I was no longer serene, or dry. I persevered, but The Moment was gone. We could, from this incident, learn that it is sometimes best to ignore people, but that would be rude, so I instead drew the lesson that cherished moments are ephemeral and unpredictable and it is, therefore, important to embrace them whenever we are able, for we know not when, or if, they will come again. And once they’re gone you’ll find that you’re just sitting in the rain smoking a damp cigar. Oh yes, single-pane windows. Gotta love 'em.